"Can You Hear Me Now"
This 10 image slide set was entered into the essay competition at the DVCCC. You say to yourself, “What is an east coast boy doing out west?” What else except, gearing up for a rodeo. I was in Cody,Wyoming for the annual Rodeo Stampede and attending a workshop being run by Bobbie Goodrich. We had access to anywhere in the arena. Having never shot an event like this before, I started to scout for locations and fire off some test shots. Trying to figure out the lighting, like where is the sun during the day shots and dealing with high ISO’s at night to stop the action, was proving to be a challenge. I was able to mingle with the people behind the scenes for quite a while before the action started. It is amazing to see how focused the riders were. When I came eye to eye with what they were going to ride, I could see why. The moment to shoot had arrived. You could feel the tension in the air from the crowd, to the silence just before the rider says pull. For an instant, the loudest sound is the gate jolting open, then magic happens. 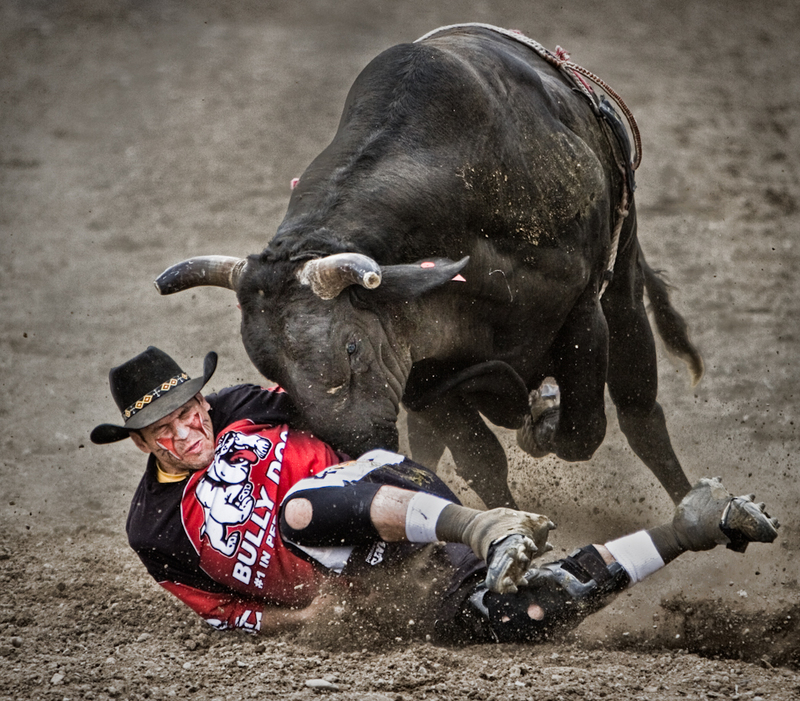 I get lost in lining up my shot and trying to let the rider and bull do their dance. The crowd is pumped but I still keep focused on this brutal, if somewhat brief, 8 seconds maximum interplay between the cowboy and his partner. If you just listen to the crowd it will reveal everything, from a just missed 7.9 second ride to the inevitable buck off. Through the dust and lights, I start to settle down and get into a good rhythm with the camera, but at a very safe distance. I have a great deal of awe and respect for anyone that would get on a 1500 pound bull for ANY amount of time. The awesome size and amount of power it takes for an animal of that size to get off the ground, is jaw dropping. Never mind the ouch factor of watching and wondering who will hold on for the seemingly unreachable time of just eight seconds. For me the revelation and god like powers of the rodeo clown were mind-boggling. They constantly step in front of these animals to keep the riders safe. It was like a dance with the devil and sometimes the devil won, to body slamming excess. I don’t know what goes through the rider’s mind, but my adrenaline is pumping. Action is fast and almost nonstop. I only get a breather, and this is sad to say, when a cowboy is ejected. The power and grace of such a huge animal is both exhilarating and scary to watch. Not many reach the coveted 8 second mark, while a lot just last a couple of seconds. When one skilled, and in my eyes, very lucky rider gets close, the crowd is deafening. “So you still want to be a cowboy?” Well as for me- I am very happy to be on this side of the lens. Part 2 of this post can be viewed here.